Jonathan Prince’s Torn Steel series stands tall in a changing art world. What does it mean to rip or tear steel? It suggests a forcible encounter, brute strength, a paradox – a rending asunder of a material that cannot be torn. Or it may suggest, as the past tense does, that the industrial age that built the twentieth century has been torn -- has been broken -- and needs mending. Given the precipitous state of the world economies, “torn steel” seems like a perfect metaphor. Another surprise twist in the equation is that our gentle giant -- the artist -- rips into four geometric forms that take us through every era in human history – the square, the circle, the column, and the torus. In geometry, a torus is a ring formed by two circles that rotate around an axis in horizontal and longitudinal directions. The resulting ring shape suggests movement. The four forms remind us both of Euclidian geometry and of the ways we use these shapes in myriad ways in our daily lives. We know that Leonardo da Vinci juxtaposed the circle, the square, and a human form in Vitruvian Man as measures of ideal proportions. Many artists, including Donald Judd, Richard Serra, Isamu Noguchi, and Anish Kapoor, have weighed in with their interpretations of these forms – variously using metal, stone, building materials, and light -- and it is no surprise that these are among the artists whose work Prince has studied carefully. Each of the four works has its own form, name, and kinds of movement. Disc Fragment, 9’ x 8’ x 5’, is a flattened sphere -- the world optically distorted. Its ruptures suggest both earth’s mineral treasures and the ways that strip mining and other enterprises damage the earth. Or, being less literal, the ways that the “torn” silvery spaces interrelate with the umber surface of the steel disc seem poetic and sensual. The “torn” areas somehow relate to the metal grid of the atrium as the more earthy umber disc contrasts yet connects with the green trees. Vestigial Block, a six-foot cube, seems to reveal its insides, and even though its gash is deep, it upholds the majesty of its six-sided form. The diagonal splitting of the cube gives us three uneven triangular shapes on one side. The curve and slope of the diagonal is unexpected, almost a body or earth shape. Torus 340, 14’ x 12’ x 8’, leaves a 20-degree gap in the circle; its facing discs, with their “torn” edges seem magnetically drawn toward each other. The form, balanced on an 8-foot square pedestal, turns easily. Being composed of circles that go in horizontal and vertical directions, the torus has a double symmetry -- which the artist purposely interrupts -- to open up narrative micro and macro possibilities. 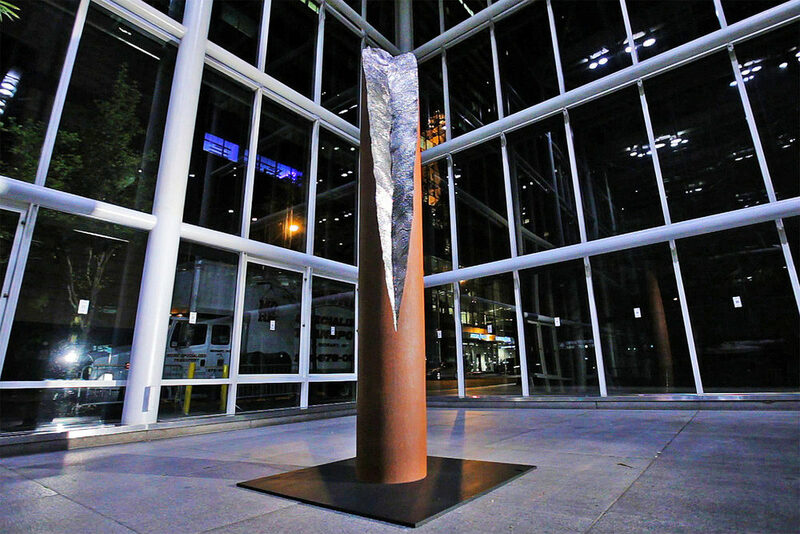 As Totem, 12.5’ x 2’ x 2’, rises high, this cylindrical form’s “tears” from above and below suggest multiple “wounds.” At the same time, what is torn in each form has been repaired by over layers of mig and tig welds that suggest patterns as delicate as leaf veins or insect wings or microorganisms. Just as leaf mulch Disc Fragment, 2011, Oxidized Steel & Iron, 9 x 8 x 5 feetmay fertilize the trees from which they have fallen, Totem’s “torn” areas may suggest its eventual metamorphosis, or, alternatively, its “battlescars” may be emblems of its epic survival. Totem, as with all works in the Torn Steel series, has its own narrative, masculine and feminine interworkings, and an interplay of hue and texture.